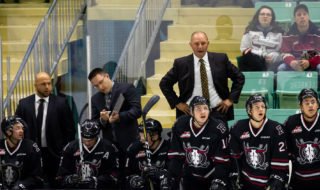 His next start will be Riley Lamb’s first of the season and the second-year Red Deer Rebels netminder is eagerly anticipating that assignment. The Rivers, Man., native suffered an upper body injury in practice prior to the start of the season and has just recently been cleared to return to action. Lamb was back at practice this week, prompting the Rebels to return 16-year-old Byron Fancy to the Lethbridge midget AAA Hurricanes. Fancy served as the back-up to rookie Ethan Anders — and even started, and finished, a game at Cranbrook — following the Oct. 26 release of 20-year-old stopper Lasse Petersen. Anders, 17, has performed at a high level in Lamb’s absence, but the 19-year-old is prepared to get into his share of games as quickly as possible. “I’ve been skating for probably 15 days now so I feel like I’m definitely ready to jump into a game and help the team,” Lamb said Wednesday. 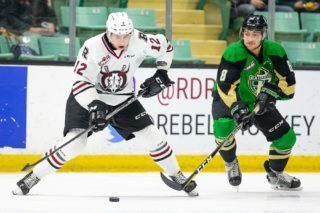 The Rebels depart Thursday for Kamloops, where they will meet the Blazers the next day in the opener of a five-game road trip. Lamb will undoubtedly get a start at some point on the eight-day jaunt, although GM/head coach Brent Sutter won’t rush him into action. “Getting him up to game speed is going to happen as we continue to practise him more and get him into a game here and there,” said Sutter. As the Rebels boss pointed out, Anders will remain as the club’s No. 1 stopper for the time being. 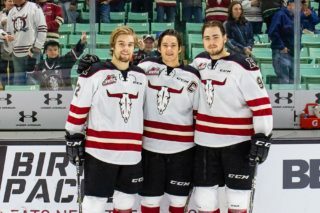 In a perfect world, Lamb and Anders will provide the Rebels with a solid one-punch between the pipes through the rest of the season. “He’s probably been our best player this year, so hopefully I can come in and push him and he can push me and we can be a good tandem together,” said Lamb. Lamb enjoyed a fine rookie season with the Rebels last winter, posting a 3.69 goals-against average and an .899 save percentage with three shutouts. 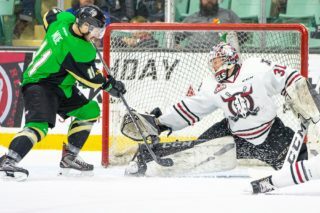 He stood tall in post-season play, recording numbers of 3.69 and .894 as the Rebels dropped a tough seven-game, opening-round series to the heavily-favoured Lethbridge Hurricanes. “It was all right for it being my rookie year in the league,” said Lamb. “It was a little overwhelming at times but hopefully I’ll be more consistent this year and the team can lean on me to win some big games. The Rebels have dropped their last four games and head out on the road with an 8-9-1-0 record. Lamb, however, doesn’t see that losing pattern continuing. Chase Lowry decided he didn’t want to be a Grizzly and has gone into hockey hibernation. The Rebels reassigned the 17-year-old forward to the Olds Grizzlys of the Alberta Junior League Oct. 27, but instead of going south, he headed north to his home in Edmonton. As a result, he’s been suspended indefinitely by the Rebels. 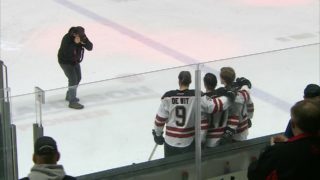 “If he couldn’t play in Red Deer, he was going to quit hockey,” said Sutter. “We reassigned him to Olds so he could groom his game and get better and also help their team. “He would be close to us so we could use him if necessary. He could get ready to be a really good player for us next year, but he chose the other route by wanting to quit hockey. “So be it. I’ve always wondered that if kids don’t have the passion to play, why are they playing? As you advance you just fall further and further down the ladder. He was at the bottom trying to climb up but he didn’t want to put the work and commitment into it that was necessary to be a player. Lowry was a third-round pick of the Rebels in the 2015 WHL bantam draft and after scoring 14 goals and collecting 28 points in 32 games last season with the Sherwood Park midget AAA Kings, appeared in just two WHL contests this fall. Quite clearly, Lowry never impressed the Rebels coaching staff enough that he could play on at least a semi-regular basis. “It bothers you when players have the talent and skill set like he has, but can’t get him to make that push to get better,” said Sutter. “Then when they decide they’re going to quit it just tells you why you couldn’t get it out of him.